Maybe it was the gloves I’ve been wearing lately. Because our church is extremely cold during the week (well, cold if you’re a completely Southern California acclimatized person like me — did I really grow up in Michigan? ), and because my hands are cold most of the time anyways, I went out to the local drugstore and picked up a pair of two dollar magic gloves. The magic quickly wore off, however, when I realized that I couldn’t type with those gloves on. So I did what any reasonable person would do and I cut off the fingertips. While these aren’t Grizzly Paw weightlifting gloves, Patrick Swayze Roadhouse-style motorcycle gloves, or awesome 80s flashbacks, my low budget fix keeps me warm as I type away (and mop the hallways and move tables, etc.). 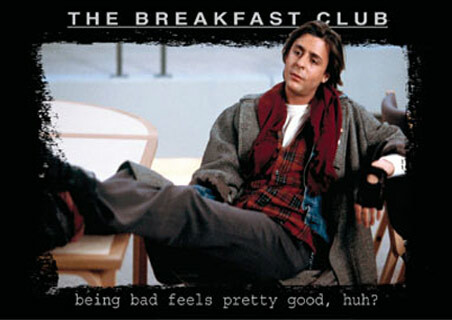 Actually, my goal is to be like John Bender, Judd Nelson’s erstwhile criminal of The Breakfast Club. Such a range of emotion — subtle rebellion sowing, righteous defiance, earring-switching sensitivity, Friday casual, straight up kicking it, victorious anti-hero. — and all of this based on the gloves. Not even Principal Vernon, with his confusing I love rock-n-roll but the next time I have to come in here I’m cracking skulls hand gestures could stop this force of nature. Yes, that is what I’ll keep telling myself. It was the gloves. Oh no you did not just complain about the cold weather in southern California! 15 degrees over here, my friend…15 degrees! Rich – I know, I know… I’m a bad man. For real, though, anything below like 60 feels freezing cold. Even reading about your weather makes me want to climb into bed underneath four or five blankets.